Concord celebrated World Book Day today – on a bus. And some staff and students dressed as their favourite book characters. 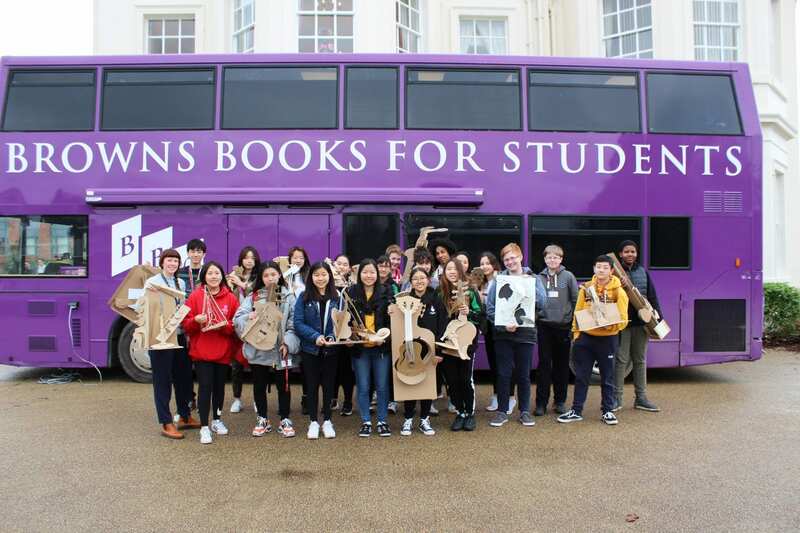 Concord Lower School art students won a national competition to secure the visit of Browns Book Bus for a day on the campus by designing sculptures of musical instruments from Browns' cardboard boxes. Students and staff were invited by Head Girl Alisar and the prefect team to dress up as a favourite book character. Lower School students visited the bus as part of their English lessons and selected one or more new titles for the library. Concord Librarian Mrs Anne Williams was hopeful that this would encourage students to think about what sort of books their friends might like to read. It was also hoped that this would lead to some interesting discussions and peer recommendations. Sixth form students also visited the Browns Book Bus during their free periods and were fascinated with the stock of over 4,000 books on the upper deck mobile showroom. Concord students took advantage of the eight electronic displays providing additional information on the content and education resources. Using mobile stock scanners, they were able to enjoy browsing the books and scanning titles to create selections.